The episode started with Jackie was reported by a certain neighbor to her mother and father as seen on television. It was during a certain moment when she grabbed the microphone from the reporter and talked to the television asking for the capture of the one responsible for destroying her scooter. Her mother and father rushed to the television to watch her. When she arrived home, Gabriel was with her. It was because Gabriel vowed to fix her scooter and he will be able to bring this to his friend. Jackie’s mother and father suspected Gabriel was Jackie’s boyfriend that is why they warned him but Jackie said that he was the one who hit her motor. It was then that her parents were able to understand Gabriel’s purpose. Gabriel went home and he prayed for the food. His family was so happy that they were with Gabriel and his mother told him to be aware of his health and not just his works. In Daniel’s working place, he had the opportunity to discuss with his father his plans on Franco’s family and he was told not to let go of it since he has already started. When the motor was fixed, Gabriel went to Jackie’s house to return it and he rode on it. When Jackie saw Gabriel, she was instantly surprised and noticed Gabriel’s looks. When Jackie’s parents saw that the motor was fixed, they appreciated him and said that he was not just handsome, but also responsible. On the other hand, Natalia was in dilemma of either giving her fiancé another chance or she will consider Gabriel. She was constantly looking at her inbox for text messages possibly from Gabriel but there was nothing. Her friend asked her if she was ready to allow Gabriel since her father will surely check everything about him from head to toe. Natalia considered what her friend suggested. Franco visited Samuel on jail and told him that he was happy seeing him suffering. It was Franco’s plan to put Samuel on jail and he had the notion that Isabella might be alive. A message was rendered to Gabriel about the plans of killing him that is why one of Samuel’s trusted wardens had a plan to let him escape but Samuel said that he will do this on his own. The warden refused and he said that he should have executed the plan way back before. 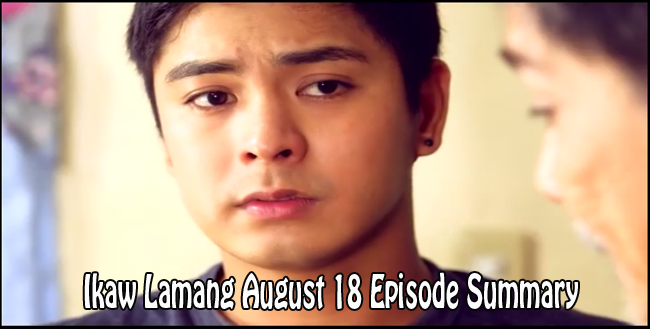 Read all other Episodes Summary of Ikaw Lamang here.